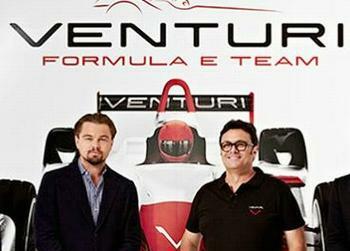 MONACO, December 11, 2013 (ENS) – Actor and environmental activist Leonardo DiCaprio and Venturi Automobiles have co-founded a racing team to participate in the new FIA Formula E, the first international championship for 100 percent electric cars starting in 2014. Based in Monaco, the new Venturi Grand Prize Formula E team was co-founded by DiCaprio and Gildo Pallanca Pastor, president of Venturi Automobiles, a manufacturer of high performance electric vehicles. “The future of our planet depends on our ability to adopt cleaner and energy efficient vehicles,” said DiCaprio Sunday, announcing the new team. Formula E, officially the FIA Formula E Championship, is a class of auto racing sanctioned by the Fédération Internationale de l’Automobile (FIA). The “formula,” is a set of rules with which all participants’ cars must comply. Formula E is intended to be the highest class of competition for one-make, single-seat, electric racing cars. The series was conceived in 2012, with the inaugural championship to be held in 2014–15. The series will begin in September 2014 and take place in the heart of 10 of the world’s major cities – they are: Beijing, China; Putrajaya, Malaysia; Rio de Janeiro, Brazil; Punta del Este, Uruguay; Buenos Aires, Argentina; Los Angeles, California; Miami, Florida; Monte Carlo; Berlin, Germany and London, UK. Ten teams, each with two drivers will compete in the unique series created to attract a new generation of sports car fans while accelerating the electric vehicle market and promoting sustainable development. Racing circuits through the cities will be between 2.5 and three kilometers long. Cars will accelerate from 0 km/h to 100 km/h (zero to 60) in three seconds, with a maximum speed of 220 km/h. “It is an honor and a pleasure to welcome the Venturi Grand Prix team as the tenth and final team to join the FIA Formula E,” said Alejandro Agag, CEO of Formula E Holdings, sponsor of the championship. “Of course, I would like to reserve a special welcome to Leonardo DiCaprio. Few environmental leaders have contributed as much as he spread the message of sustainable development worldwide,” said Agag. The Venturi Formula E team is centered around Venturi Automobiles, a leader in high-performance electric vehicles, developing a range of electric sports cars, urban and commercial vehicles. Venturi Automobiles also holds the world record speed electric vehicle with the speed of 495 km / hour. “Venturi is a pioneer in high-performance electric vehicle for over 10 years and Formula E gives us a fantastic opportunity to further improve our technology through motorsports and participate in races around the world,” said Venturi president Pallanca. “It also gives us the chance to participate in a new racing program that deeply shared values Venturi for clean mobility, innovation in electric propulsion and optimization of energy efficiency.” he said. DiCaprio’s group will compete against Andretti Autosport and Dragon Racing, Asia’s China Racing, Super Aguri and Mahindra Racing, and European squads Drayson Racing, e.dams, Audi Sport ABT and Virgin Racing. The FIA?Formula E Championship is designed as an “open championship,” inspiring manufacturers and constructors to build their own electric cars. For the inaugural season, each team Will run the single-seaters supplied by the promoter Formula E Holdings. Forty-two cars were ordered in November 2012, with Formula One team McLaren providing the motor, transmission and electronics that all cars will use. In the second racing season, the Venturi Grand Prix team plans to become a constructor by building its own Formula E cars. The first of them will use a powertrain based on the world’s most powerful electric car, the Venturi VBB-3, unveiled by Prince Albert II of Monaco earlier this year at the Bonneville Salt Flats in Utah.